← Did God Create An Imperfect World? Chapter XVII. All the Degrees in Trines. THIS diagram presents the whole man in successive trines. 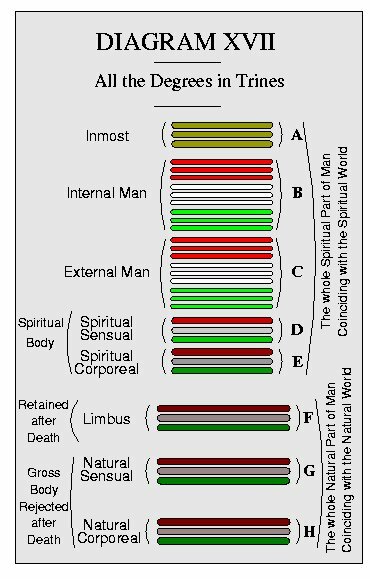 The inmost A is drawn in three planes, also the spiritual sensual D, the spiritual corporeal E, the limbus F, the natural sensual G and the natural corporeal H.
The trinality of the natural body in its most obvious form of head, trunk and extremities is well known. The natural sensual G is composed of the five senses, – sight, hearing, smell, taste and touch. Some of these are more properly organs of the will and are called voluntary, others organs of the understanding and are called intellectual. “The sensual which is subject to the intellectual part is especially the sight, that subject to the intellectual and next to the voluntary is hearing, that subject to both together is the smell, and still more the taste, but that subject to the voluntary part is the touch.”- AC 5077. The trinality of each of the senses is included in the doctrine that in every created thing there are three degrees, – essence, form, and operation, derived from end, cause and effect, all three of which are necessary in the constitution of any and everything, that it may exist and be preserved. For example, in the sense of sight there is the essential of sight, the organ of sight therefrom and the use of these which is actual sight. The trinality of the inmost besides being manifest from the doctrine of trinality in all things and in each (AC 9825), may be confirmed by the following considerations. The inmost is the especial abode of the LORD in man. From this He forms, preserves and governs the trines below. Hence the trinality of the internal and the external man. And as there is an influx from the LORD immediately from Himself into each of the three degrees below this Highest, there must be a degree of this His Sacred Abode from which He flows into each of the lower degrees respectively,. otherwise there would be neither adaptation nor correspondence.